Prof. Chris Bode, the Chief Medical Director(CMD) Lagos University Teaching Hospital (LUTH) Idi-Araba, Lagos has said that the hospital’s management has resolved all labour disputes with its health workers. Bode, in an interview in with Independent confirmed that the various unions at the hospital had also made a pact with the hospital management not to go on strike for the next 12 months. Doctors, nurses and various unions at the hospital had staged several protests to register their displeasure with its management in the last three weeks. However, the CMD also explained that the recent crisis that surfaced between Management and some union members at the Lagos University Teaching Hospital has been amicably resolved. “The Management of LUTH had a round-table family meeting with the union officials and a number of confidence building measures were discussed to consolidate the current successes so far recorded to reposition LUTH as the preferred destination for Nigerians in need of specialised medical care. “This followed the intervention of many eminent personalities who had expressed concern over the threat to peace within the teaching hospital. “All parties agreed the whole crisis stemmed from a series of misunderstandings and have since resolved to work together towards the common purpose of working hard to achieve the first year of strike-free service after so many years of service disruptions. Also, the Dr. Odusote Olumuyiwa, Chairman, NMA, Lagos Chapter, confirmed that the recent crisis that surfaced between Management and some union members at the Lagos University Teaching Hospital has been amicably resolved. 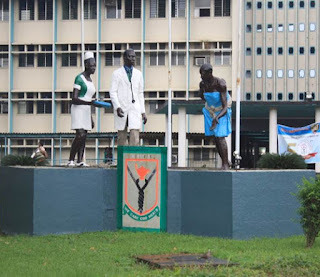 According to Dr. Odusote, the Medical and Dental Consultants’ Association of Nigeria (MDCAN) LUTH Branch, the National Association of Resident Doctors among others waded into the matter and directed LUTH management to allow the resident doctors to remain in the secretariat, while it, the former tidy arrangements to move to a new location. The statement read: “The recent crisis that surfaced between the management and some union members at LUTH has been amicably resolved.